Two free-response questions involving work and energy are given below. The first question is meant for AP Physics B and the second question is meant for AP Physics C aspirants. If you are preparing for AP Physics C exam, you should be able to answer the questions meant for AP Physics B as well. (a) Determine the velocity of the 2 kg mass m1 immediately after the collision. (b) State whether this collision is elastic or inelastic. Justify your answer. (c) Calculate the kinetic energy lost by the 3 kg mass during its forward trip along the rough track CD. (d) Determine the maximum height ‘x’ up to which the 3 kg mass will rise along the smooth track EF. (e) If the 2 kg mass m1 is removed (without disturbing any other thing) immediately after the collision, determine the distance from C where the 3 kg mass will finally come to rest. The above question carries 15 points and you have about 17 minutes for answering it. (2) An object A of mass 5 kg moving along the positive x-direction has displacement x given by x = 0.2 t + 0.18 t2. The force acting on the object ceases after 5 seconds and the object moves with uniform velocity. Another object B of mass 10 kg moving in the positive y-direction has kinetic energy equal to the potential energy of a spring of force constant 3000 Nm–1 compressed through 0.1 m from its natural length. 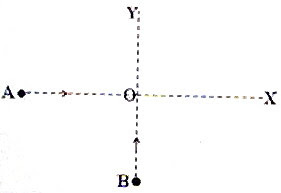 The objects A and B moving with their respective constant velocities collide at the origin O and stick together. (a) Determine the momentum and kinetic energy of object A just before collision. (c) Calculate the velocity of the combined mass (after A and B stick together). (d) Calculate the change in kinetic energy of the system because of the collision. (e) Is this collision elastic or inelastic? Justify your answer. [The above question is worth 15 points and the time at your disposal is about 15 minutes]. Try to answer these questions. I’ll be back soon with model answers for your benefit.